How did you react to the stock market’s (defined, in my mind, as the S&P 500 index) recent precipitous drop? If you’re like many investors, you moved out of ‘risky’ assets such as stocks and into ‘safe’ assets such as money market funds and stable value funds. Unfortunately, the seeming safety of fixed income investments is a mirage… hidden forces, such as the danger of inflation, make ‘safe’ investments less safe than first glance. Paradoxically, the recent movement to safer portfolios has put many people at risk for a reduction in the real value of their money in inflation adjusted dollars: literally the hidden risk of not enough risk. Inflation can be looked at as another tax. Your marginal rate will come off the top, and inflation will come off after that. 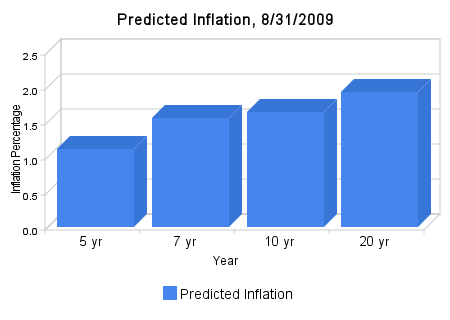 If inflation comes in at 1.12% over the next 5 years and you pay 50% in taxes, your real yield is .31%. Hopefully the market is correct about the inflation risks. On the other hand, money market rates average 1.17%, so if they don’t move (they would move in response to interest rate changes, however) for a while your real yield will be negative. The WSJ article points out that time is your greatest ally in the fight to secure your retirement. Financial Engines ran a study which found that a 60 year old clearing $75,000 a year and 50% in stocks could expect to retire at 67 where they could once retire at 65. Being in more cash based investments will force the investor to postpone retirement another year… even if maintaining their current 9% 401(k) contribution rate. Ouch. For those close to retirement, it’s important to remember that you will most likely be living a long time in retirement. Once you get there, it may be prudent to leave some money in stocks in order to catch some of the advance of the market (and deaden the blow if it tanks by not having as much in stocks). If you’re completely in cash, it will be hard to maintain your money if, as you probably wish, you live longer than you planned (and I think you’ll agree that’s a good thing!). If you’re younger like me, stock market declines are a bit of a ‘sale’. They are like a subsidy for those with a long time horizon to hop into the market and ride it for many years. Happy investing!